This has got to be a universal experience. You know, perusing a paragraph and having the adjectives jump a line or two...which enhances or confuses the point. Now about the giant panda. Mei Xiang (may SHONG) is a female giant panda. 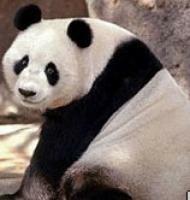 Giant pandas are an endangered species that does not, on the whole, do a very good job at reproduction. Females ovulate once a year (cry me a river) and are fertile for only about 3 days a year. They generally produce a single birth once every 2 or 3 years. One must question, on a Darwinian level, why are we so hellbent on compensating for this? I know, I know, they're cute. From a distance. Breeding in captivity doesn't seem to be very successful either. 5 of the 5 cubs born at the D.C. Zoo have not survived. Nor were Mei Xiang and her beau Tian Tian successful in the mating arena—so artificial insemination (champion of lesbians nationwide) comes to the rescue. "Volunteer watchers noticed signs of Mei Xiang going into labor, including restlessness and panting, about 1 a.m." (nationalzoo.si.edu/Animals/GiantPandas/) The spokesperson adds that she was grunting and "vocalizing." So everyone is on high alert and a little over 2 1/2 hours later, the panda baby is born. It weighs in at 3-5 ounces. 3-5 OUNCES, forchristsake. The size, we're repeatedly told, of a stick of butter. Okay, okay, okay. So you're telling me that a 200 lb. animal makes all this fuss and takes 2 1/2 hours to produce the equivalent of a normal bowel movement? I'm so sorry I can't appreciate the magic here, mired as I am in disbelief. What was all the fuss about? When was the last time you couldn't sleep for 2 hours, then panted and whined because you needed to take a standard-issue dump? I'm not talking about coming back from a nightmare camping trip and have 5 days worth of stress food-retention. I'm talking a stick of butter. And I'll bet you she felt all bloated and unattractive with those 2 lbs she put on. Perhaps I'm a little bitter (and have lost all panda sympathy by now). Being a human female, my firstborn was not 1/900th of my body mass. More like 1/20th. And most of us can't sleep, are restless and "vocalize" because our stick of butter has a cantaloupe* leading it out. And labor feels like a giant charlie horse from your rib cage to your birth canal. Which, I might add, is about the size of a stick of butter. Not to mention that we incubate our young for 9 long months and have the ability to drop at least one every year. We ovulate every damn month and may be fertile up to 12 weeks out of the year. Were it not for the development of brain matter and the basic desire to keep one's teeth from falling out, we could be pregnant every year from 13 to 50. Thank goodness the civilized have learned to regulate these little miracles—except for those poor sots participating in the Reproductive Olympics (Team Mormon and Original Team Catholic). Congratulations, Mei. As soon as the stick of butter is large enough, we'll be able to see if it's a male or female because right now everything is TOO tiny. In the meantime, rest up for the strenuous nursing of that baby rat. *One last thing. I broke one of my critical rules. Comparing anything that is removed from or exits out of the body to fruit. You know, the proverbial grapefruit-sized tumor, godsaveus. The comparison of the panda poop offspring to a stick of butter is quite refreshing. So much better than a small banana or whatnot. This post is hilarious and manages to combine two of my favorite things: cute bears and butter! Woo-hoo! Once again - I am so thankful that (being a gay man) I am incapable of not only conceiving my own little tub of margarine but may also avoid experiencing all the annoying side effects associated with the gestation and eventual birth of said butter. As always, my goddess Epiphenita, you make me howl with laughter. Not a panda howl, perhaps, but more of a large, overweight basset howl. A basset hound with a sinus problem.